The aim of this project is to produce a low cost scientific instrument that can be used in schools or by individuals. Wind speed and direction kits for data logging on a PC cost at least forty pounds everywhere that I have seen. But, there is no reason that they can't be built much cheaper. Take one mouse. Sift into a pyrex bowl. Drill a hole in the side next to the wheel shaft. Glue a lollipop stick to the wheel, making sure that it can still spin freely. Cut a length of biro shaft shorter than the protruding lollipop stick. Glue it to the outside of the case so that it protects the axle. Attach a piece of cardboard to the axle, either as a wind vane or a propeller. Corrugated cardboard works best as the axle will slot into it easily. Bake at gas mark 4 for seven years. Spin round once, measure distance travelled. Can calculate position from this. Mouse acceleration must be off. 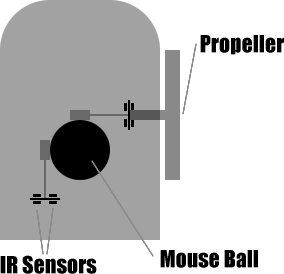 Could read mouse data direct from serial port. But then, we have to know about all possible mouse protocols (and run it as root). Easier to just configure the mouse normally then read the position at a high level. Could use Curses, Xt, Gtk or vgalib. But, can you configure two mice to coexist happily on one system? The program will probably be small and just spits out a single angle. Then, it can be cron'd so that we can massage the data later. This concept is distributed according to the GNU Public Licence and was written by Toby Jaffey.